Shern got to bond with his two yee-yees while in Phuket. He has always love Min-yee, always going to her room to play with her. When Wen-yee was back for holidays, Shern was so happy to see her. He had another person to play with. 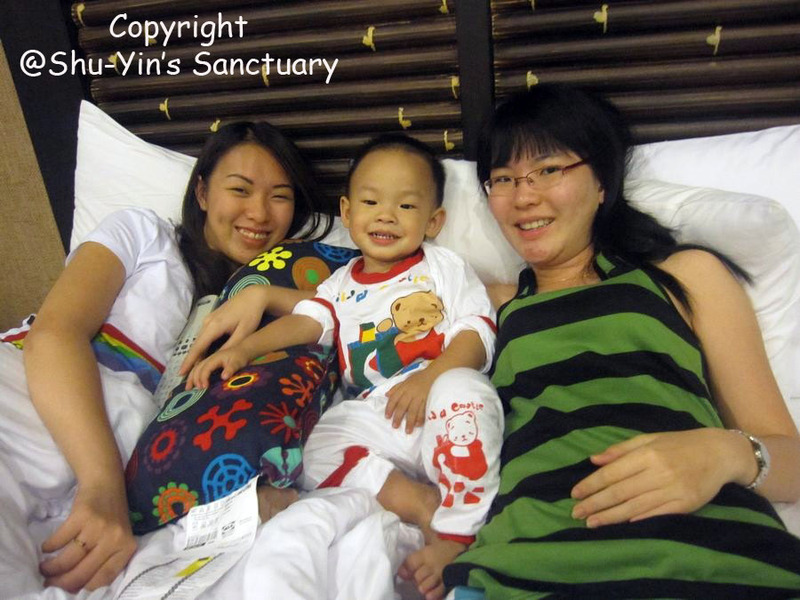 In this photo, Wen, Min & I were sitting on the bed in the room of our hotel in Phuket. Then Shern came in and squeezed himself in between Wen-yee & Min-yee. 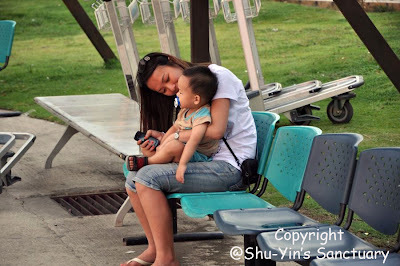 Here, Wen-yee brought Shern out for a breath of fresh air at the LCCT. Shern was delighted to see so many buses. And surprisingly, Shern loves Uncle Ian. He loved to go peek at him in the room. Or took his hand to play with him. Here, Shern was having a conversation with Uncle Ian. Now that both Wen-yee and Uncle Ian's back in South Africa, Shern misses them a lot. He loves it when he sees photo of them. I must teach Shern how to eat the food that I like more... Shern always trust the food I am eating and likes to eat wan ah! haha. now he likes soup. and fish balls. and fish.